While standing on your bully pulpit spouting about "manufacturers misleading tens of thousands of consumers" you have become the leading "misleader". You may not like this 75% LHV value, but using the B4.15 standard, most stoves will pass. The EPA has more information than that from the companies you list. Why they do not post it is a question for them. They have all the data from all the stoves. I like to support your efforts, but you are so quick to spout righteous, ill informed nonesense, it is very disappointing. If you want to be a spokesman, at least get your data from somewhere. Stop using words like "might" or "may". If you have data, say it. It is curious to me how you can stand on your self-righteous bully pulpit claiming that your opinion is data while ignoring actual data. You have knack for it! Congratulations. You may not like that 75% LHV was enacted, it was. 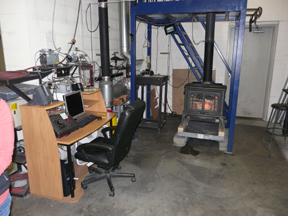 EPA has all the test data from all listed stoves. If the efficiency was important to them, they could calculate it the same way us evil manufacturers do, with Excel. If you ever would like to see this companies spreadsheets; once again, I offer them to you. I do not think the “evil ones” are as willing to lie to the Federal Government as you may think. This company does not, and I do not appreciate your biased accusing words. Why some efficiencies are updated on the EPA website and others are not, is a question for EPA. Ours were submitted for the stoves we have data for, a while ago and do not appear. Instead of using accusational words like “may” or “might”, get you data right and say “is”. Thanks for your post. As a manufacturer of stoves, you are in a position of influence and I very much want to clarify a few things. 1. The Alliance for Green Heat supported a change to 70% efficiency HHV instead of 75% LHV. But equally important is establishing a standard way to test and report. Currently, manufacturers can use many, unofficial ways of testing efficiency. We support a level playing field so that all manufacturers and consumers know how efficiency is being determined. 2. When test labs send their efficiency data to the EPA prior to May 15, 2015, it was almost always marked CBI - confidential business information. So yes, the EPA has lots of data, but by law they are prevented from releasing it because the labs have a practice of sending everything CBI. We tried to get the EPA to release it, but the companies will not let EPA release. We explain this in detail in this blog. 3. We are not claiming that your company or others are lying to the Federal Government, but what is happening is that many companies use efficiency calculations that exaggerate their numbers, and they justify it by saying that Congress was not explicit in how they should measure efficiency. 4. The EPA can only post the efficiency numbers of stoves that specifically request those numbers to be disclosed. If you submitted them and the EPA hasn’t posted them yet, you may need to nudge them and confirm that they were properly submitted. We wrote a blog about this, recognizing and thanking those stove manufacturers who are willing to release their efficiency numbers. 5. There is a good argument to be made that to get tax-payer subsidies for the purchase of stoves that are 75% efficient or higher, companies should have to publicly release their actual efficiency, like HVAC equipment has to do to get Energy Star qualified. Ultimately, I suspect that Congress and the IRS will want to just refer to the efficiencies posted by the EPA on their list of certified stoves and the list of certified boilers. Then, consumers know they data is provided by a third party lab and the same efficiency calculation was made. 6. Efficiency data is already required for all boilers, and you can see that many boilers are way below 75% LHV on the EPA boiler list. We assume that boiler companies with third party efficiency numbers under 65% HHV will not claim to be over 75% LHV. Carry on. I think AGH meets the highest standards of honesty and integrity in the biocombustion community. If there is nothing to hide, let manufacturers report their efficiency numbers to AGH directly where they will see the light of day. Please persist with advocating "real efficiencies" or higher heating value (HHV) efficiencies as opposed to "lobbyist's, legislator's, European, counterfeit, or Lake Wobegon efficiencies" that are based on lower heating value (LHV). There are overwhelming compelling reasons to use real efficiency rather than the other one. 1. It's honest. With LHV efficiency, one can measure values greater than 100%. Like Lake Wobegon's children, that's a logical impossibility. 2. It's the standard for other fuels. It places biocombustors on the same playing field as other fuel burners like natural gas or oil-fired appliances that are rated by HHV efficiency. 3. It is scientifically respectable. Counterfeit efficiency is clearly favored by manufacturers who profit from this distortion. Hence, lobbiests have evidently succeeded in convincing legislators who don't know any better to specify it in setting standards despite its lack of scientific rigor and integrity. We are all biased in supporting the use of biofuels, but nothing is gained through deception and dishonesty. Thank you for your efforts to support honest and transparency. John, I can see why you don't normally respond to posts and emails. While "not honest people" like to post on your blog without showing who they are or at least a real way of finding out their real intentions are, I am trying to promote a new design or what I feel is a better combustion design. I have a website (dakotastove.com) and am a real person. I also have a kickstarter campaign and would like as many people to visit it and ask questions - as many questions as possible so people understand it. I can be found on facebook, Andrew Murray, owner Round for a Reason LLC and Sand Lake Tree LLC. If the above commenters are real, my apologies but if your company makes a square, rectangular or horizontal cylinder stove or furnace, it is not the best technology available. Round for a Reason llc is looking for outside help for improvements and ideas. While I tried to get into the stove competition, for some reason I don't get a chance to show what my stove can do.